Skraecko-what? That was my initial reaction upon first hearing of these four gents from Norrköping, Sweden. Turns out the name means "horror lizard" and it's an homage to a fictional beast thawed from the polar icecaps due to global warming and set upon humankind as a sort of retribution for our haphazard ways. Vigilante environmentalists anyone? Works for me. So with a name like that, you'd think this bunch must pack quite the sonic punch…and in that assumption, you'd be correct. "Världarnas Fall" (translation…"Worlds Fall") opens the album with enough pummeling riffs, offbeat time signatures and spastic poly-rhythms to make any fan of Mastodon crack a smile. Throughout Äppelträdet ("Apple Tree"), Robert Lamu's vocals are equal parts heavy metal howl and Gregorian chant…think Crack the Skye, not Leviathan. The lone exception being track number two, "Soluppgång" ("Sunrise"), which is surprisingly sung in English and combines the abrasive backing vocals of bassist Tim Ångström over Lamu's powerful wail. But it's Henrik Grüttner who keeps the entire ensemble from teetering into aural chaos as he layers the song with a sensational guitar harmony that'll resonate in your cranium for weeks. "Chronos" is an instrumental that's as heavy as the titan its named after and features fantastic textures of sound as both Lamu and Grüttner allow their guitars to converge and branch off and back again through a series of stops and starts and melodies that are…for lack of a better word…beautiful. You could get lost in this music. 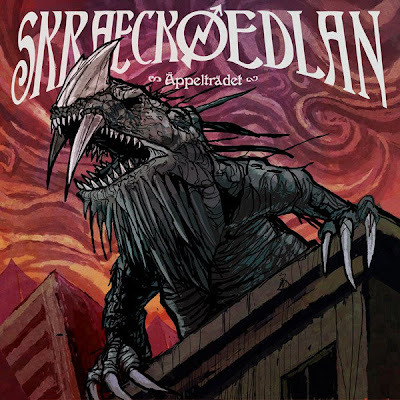 The song feels as though Skraeckoedlan wrote it as a companion piece to the album's title track as it ultimately flows right into the riff that opens "Äppelträdet". And its here where I think I realized this band had a hold on me…probably around the time that Grüttner unleashes an absolute scorching guitar solo that sounds like some wicked hybrid of Devin Townsend's wall of noise and Eddie Van Halen's fleet fingered wankery. "Haven" is a rumbling juggernaut of a song with another surprisingly catchy chorus that'll have you singing along word for word…even though its sung exclusively in Swedish. If I ever get a chance to see these guys live, I guarantee I'll be the moron up front demanding that the band play this song. "Doedaroedlan" ("Lizard Kills"…I think) sees the band slowing things down…albeit briefly…before they take off on another neck jarring riff-fest. This one sounds like the soundtrack to a death march primarily due to Martin Larsson's abuse of every drum and cymbal in his kit, which is just slightly more deafening than his bandmate's symphonic bedlam…but barely. As you've no doubt already noticed, Skraeckoedlan interweaves both English and Swedish into the vocals on Äppelträdet, and on "Universe" Lamu switches back to the latter. Here the band continues to display an ability to batter your eardrums with deafening intensity, while gracefully captivating you with memorable hooks and rhythms. On "Cactus" the vocals (back to Swedish) are layered with a sort of psychedelic, echo effect that compliments the song's down tuned, elephantine riff. If you're starting to get the impression that this album never lets up, then you're catching on. "Fågelsång" ("Birdsong") keeps plowing forward with the band's unique balance of elegance and fury, leaving a wake of thick, massive sound…and bong resin…in your dome. Speaking of which, I'm not certain, but I think the album closer "Rokh" actually translates to "Smoking Point". Here the band leaves us with a jam that features a series of intangible cross-rhythms that'll have your head spinning. I'll be honest, I'm not a fan of reviews that throw out premature "album of the year" accolades. I've listened to enough great music to know that my favorite song today will more than likely be replaced by something different tomorrow. But I'm gonna say it anyway…Skraeckoedlan has a real good shot at being at the top of my list for 2011. This band possesses a unique ability to combine dissonance, power and volume with harmony, melody and rhythm and because of that, these songs are absolutely glued into my brain. I cannot recommend Äppelträdet to you enough. In fact, I'm gonna put it to you this way…if you don't like this one, then perhaps rock music just isn't your thing.